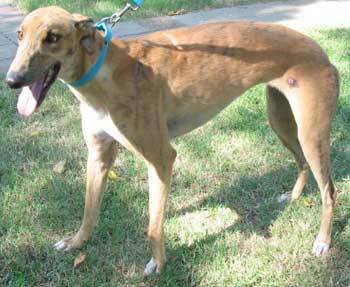 Lucy, aka VNB's Barnburner, is a beautiful two-year-old fawn brindle female born July 27, 2002. Lucy's sire is Gable Oscar and her dam is Flying Mondial. 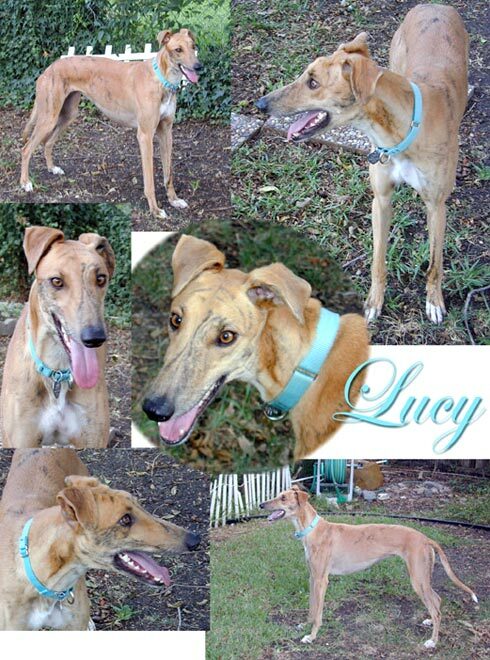 Lucy is a very interactive greyhound who will initiate direct communication with you  nothing shy about this girl! 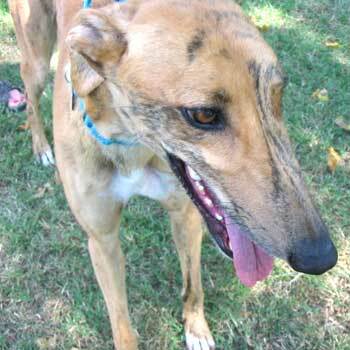 She will be a fun and lively companion for someone looking for a greyhound with spirit! Lucy appears to be small animal and cat tolerant. Lucy is a sweet, adorable young girl with a lot of puppy spirit. She LOVES to play! She can entertain herself nicely with toys, but prefers to have them tossed in the air for her to catch. She appreciates a good knuckle bone to gnaw, too. She likes to go places in the car and is getting better about climbing into the back of an SUV or back seat. Lucy also loves affection and will gaze at you with those soulful, soft eyes when nudging you for some TLC. She's a kisser, too. Lucy is a little more vocal than most greyhounds. She's quiet indoors for the most part, but loves to bark at squirrels. She'll also bark at the cats to come out from under the table and play. We've been working on her kitty etiquette, and while friendly and not really "driven" towards the cats, she still has that puppy enthusiasm for her feline housemates. (Well, she just turned two in July!) If they're sleeping out in the middle of the floor, she doesn't bother them. She's even been known to slowly nose up to one of them and lay down next to it. If Lucy goes to a house with cats, they need to be able to command her respect, which means claws and a self-confident attitude. She gets along well with the other dogs in her foster home. She seems to like small children too, but remember, she's a kisser!